The first set of 3-hours-worth-of-work was to craft out the earring base of both sides. The second set of 3-hours-worth-of-work was to stay put and set sturdy the bases. 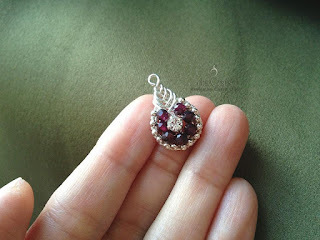 The third set was to adorn it with sterling silver round beads and the faceted round garnets beads, only managed to complete one side of the earrings in 3 hours. Special thanks to Erin Paton (earringsbyerin) for the wonderful beads, it was a gift from her 5 years ago and it had been my precious collections, today I finally used them. Miss you much Erin. I will be working on the other side of the earrings tonight, then will take a proper photo (the picture in this blog post was captured by my iPhone 5) and post it here again.